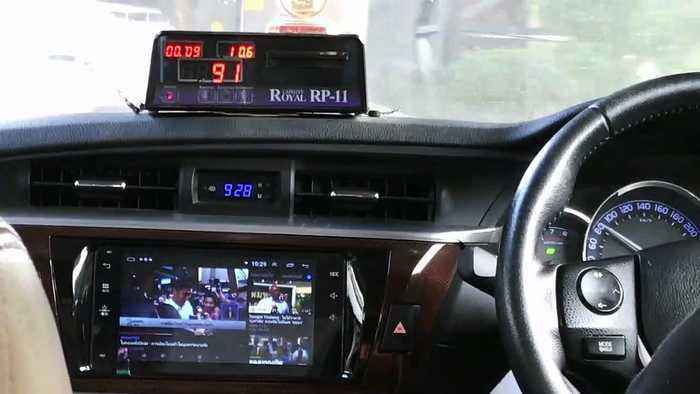 This Thai taxi driver customised his dashboard fitting with a tablet so he can watch TV, in this alarming video from southern Thailand. 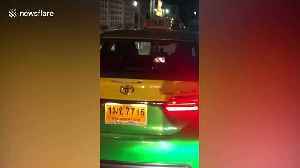 The cabbie was viewing the news while driving a tourist to the airport in Bangkok on Sunday morning (February 24), to the alarm of his passenger. The shocked tourist said: ''This can't be legal. It's also not the safest way for a taxi driver to drive their car. "I was looking over at him and his eyes were flitting back and forth between the road and the TV show playing on the tablet. This Thai taxi driver customised his dashboard - fitting a tablet so he can watch TV. The cabbie was viewing the news while driving a tourist to the airport in Bangkok, Thailand, on Sunday morning,..